While Umbria may be less known than its neighbour, Tuscany, it holds many hidden treasures just waiting to be discovered. 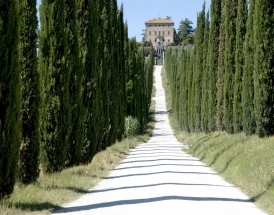 Umbria is a haven for hikers and strollers with its rolling hills covered in vineyards and olive trees. If you’re looking to recharge your batteries while still being outdoors, Lake Trasimeno, not far from Perugia, offers endless fishing, swimming, and sailing opportunities, as well as an abundance of islands and small fishing communities for you to explore. The cities of Umbria are known for their history, art, and architecture, from the Etruscan Perugia, the fortified Gubbio with its ochre-coloured walls, and the majestic Orvieto perched on its rock, to the religious Assisi with Giotto’s frescoes depicting St. Francis's life in the basilica that bears the same name. Umbria’s famous centenary pastures have made the region a food mecca. Local specialties and authentic flavours include truffles, meats, charcuterie, and cheeses, not to mention olive oil from the Spoleto hills and other regions, sought-after for its complex flavour. Come tantalize your taste buds and get a taste of la dolce vita! From country abodes to downtown digs, find a unique vacation rental in Italy or Paris and book online—more than 130 properties to choose from.